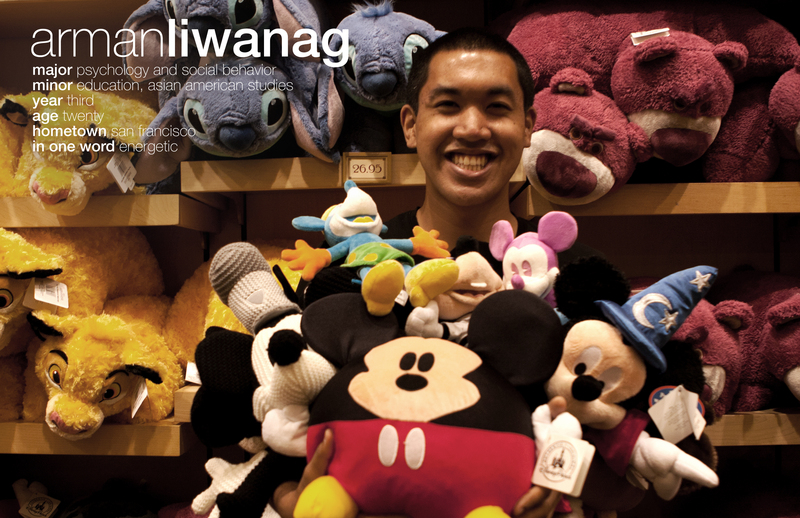 Arman Liwanag’s central passion is in the community, whether it’s advocating for underrepresented communities, or higher education. He hopes to inspire others to continue his fight for those communities and for higher education. As the year winds down, Arman is working with next year’s executive board to interview Kababayan’s appointed board for next year, and creating a vision for what they want to do with the organization. He’s also working with the other At-Large Legislative Council representatives and creating their vision for next year as well. On a personal level, he is assessing and reflecting where he is at now, as next year will be his last year. 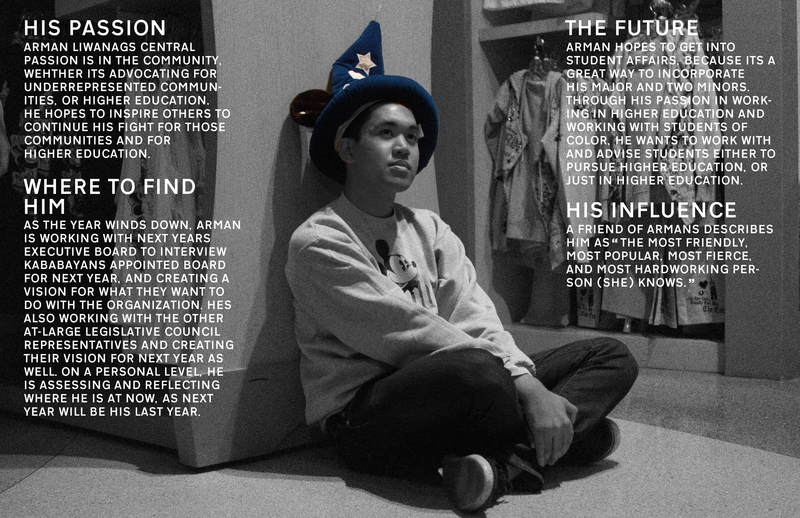 Arman hopes to get into Student Affairs, because it’s a great way to incorporate his major and two minors. Through his passion in working in higher education and working with students of color, he wants to work with and advise students either to pursue higher education, or just in higher education. AL: I was born and raised in San Francisco. I’m the youngest of three, in a Filipino American family. My parents were immigrants. I love San Francisco. It has pretty much shaped who I am, because of its environment and its atmosphere. There’s a lot of culture, and it’s very liberal. It’s an amazing place to live. AL: I’ve been heavily involved in advocating for the Filipino American and Asian American community, and I hope I’ve made a difference. One particular accomplishment I can allude to is the Justice for Filipino American Veterans march last year. I helped coordinate Alyansa, the Filipino umbrella organization, to go to that march. We brought the largest number of students there, out of all of the other universities, and I think it’s great because a lot of the students from our school didn’t even know about the issue until we had a meeting prior to it. It just inspired me that they were inspired by the issue. I think it really made a difference for them, because it was something they never knew about before and they wanted to make a difference as well. 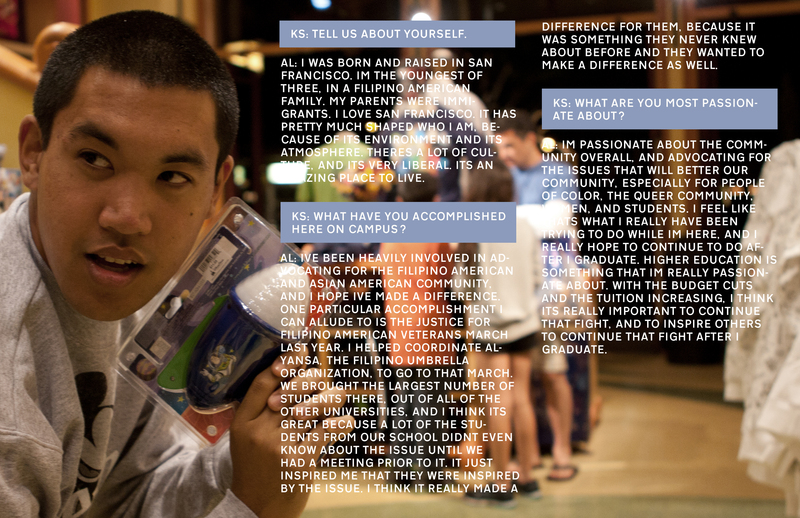 AL: My first year at UCI, I joined Kababayan and PASS, Pilipino Americans in Social Studies. In PASS, I did high school outreach, where we reached out to different communities in high school. In Kababayan, I did Pilipino American Cultural Night, PACN, and I interned as well. That led me to apply for board for Kaba, and so I’ve been on board for the past two years, and I’ll be on board again next year too. Other than that, I’ve just been involved in the Asian Pacific Islander community in general. I’m taking Asian American Studies classes – I feel that it is important because I learn a lot about our community and our history and struggles. This year as External Vice President for Kaba, I’ve worked a lot with the Cross Cultural Center, working a lot more closely with APSA. A couple of students from APSA and Kaba have started Queer and Asian, which is a support group for those who identify as queer and Asian. Also, we’ve been trying to fight for ethnic studies, and I hope to continue that next year when I’m in office for At-Large Legislative Council Representative, and also for Kaba as well. Overall, I think it’s important to help others to be inspired by the struggle of Asian Americans. AL: People in general. I think seeing people inspired, and seeing the potential in people to grow as leaders and individuals really inspires and influences me to try harder to serve the community. A particular influence on me is Jedrek Chua, especially this year, because he served as a mentor of sorts to me. He really has shaped the way I view things and has motivated me to challenge myself even harder. Another person that has really influenced me is Daniel Park, who works at the School of Social Ecology. I work with him with an access and retention program in Social Ecology, and because he’s in student affairs, he really inspires me to pursue that career. AL: I’m passionate about the community overall, and advocating for the different issues that will better our community, especially for people of color, the queer community, women, and students. I feel like that’s what I really have been trying to do while I’m here, and I really hope to continue to do after I graduate. Higher education is something that I’m really passionate about. With the budget cuts and the tuition increasing, I think it’s really important to continue that fight, and to inspire others to continue that fight after I graduate. AL: I would say an exclamation point. I think a lot of people would say that for sure. I’m really energetic, but I’m very passionate too. I feel like that goes hand in hand. I have a lot of positive energy, so I think that would describe me. I wouldn’t be in-your-face like all caps lock, but I definitely have a strong sense of energy and feeling and passion for things.